Solar energy is most frequently associated with solar electric (photovoltaic) technologies, as they involve highly recognizable panels. Photovoltaic (PV) arrays are the most common form of distributed energy (see Energy Basics for more on distributed energy) in the country. Solar electric technology coverts photons to electricity in a process enabled by impure silicon, a material that creates an electric charge when exposed to sunlight. To learn more about how solar panels work, please visit the Florida Solar Energy Center. 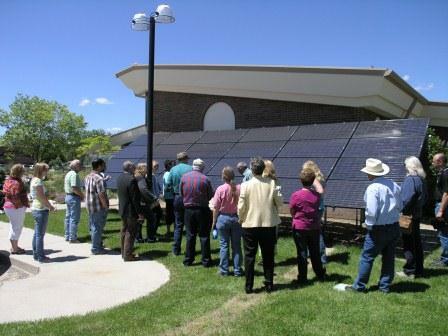 Solar electric systems have numerous applications for Wyomingites, including residential, commercial, agricultural, and industrial uses. Photovoltaic panels can be used for both grid-tied and off-grid systems. For example, many battery-based systems use PV panels because of their relatively predicable daily production, as compared to a wind turbine. The same reliability leads many homes, businesses, and public buildings to install PV panels as a grid-connected source of energy. Milt Geiger, Former UW Energy Extension Coordinator, discusses Solar Photovoltaic – the key considerations, pros and cons and explains how net metering works. How can I determine if solar electric is right for me? Electricity from PV panels is typically more expensive than grid supplied energy in Wyoming. Although Wyoming has an excellent solar resource, we also have very inexpensive electricity (the cheapest in the country at an average of 6.12¢/kWh) and few state incentives compared to other states. A great place to start assessing your options for PV is provided by the Department of Energy’s Energy Savers Tips. If you want to see how a solar electric system could perform in your home or business, use the IMBY Tool provided by the National Renewable Energy Lab. Please feel free to contact Extension to help you navigate the program! What are the principle advantages and drawbacks of PV? Rugged – able to withstand high winds and hail. Many manufacturers provide a 20-year warranty with life expectancies of 30-40 years. Predictable – Although you can’t count on the sun shining brightly every day, over the course of a year, it is possible to know quite accurately how much your PV array will produce. Reliable – Solar panels have no moving parts, so they are most often “install and forget” systems. Cost – Solar electric is seldom cost effective in Wyoming compared to utility supplied electricity. Incentives and consistently decreasing costs are improving the economics of solar electric, but it is currently a difficult investment when completed solely for economic return. Need for unobstructed southern exposure – Solar panels require unobstructed (no shade)exposure from 9AM to 3PM southern sun. The low sun angles in winter months can sometimes make this challenging in residential neighborhoods. How can I use it in agricultural operations? The reliability, predictability, and durability of solar panels provide many opportunities for use in agriculture. First, if power reliability, independence, price stability, and/or environmental reasons are important to you, solar electric can become a part of the ranch/farm home and outbuildings just as it can for other residences and businesses. Solar can also be integrated into the production side of agriculture, especially for livestock producers. From electric fencing to remote livestock water pumping, solar can be a cost effective means of increasing productivity. PV panels are the most common “off-grid” renewable energy source. They can be coupled with wind energy or other renewable energy sources to provide a robust off-grid system. As the system is removed from competition with utility provided electricity prices, solar electric can be cost effective compared with other renewable energy sources. Solar electric is eligible for significant federal tax credits, grants (for businesses), and a sales tax exemption. Please visit our Incentives for additional information. How much does a solar electric array cost? Solar electric costs vary greatly. Off-grid applications are especially variable, as costs of batteries, pump controllers, etc. can greatly influence the cost of the system, overall. In general, for grid based systems in Wyoming, the installed cost ranges from $7-9/watt before incentives. As an example, a common residential system size is 2.4 kW, with a cost of $16,800 to $21,600. Please see our ever-expanding list of Wyoming-based contractors.